Kids Yoga at PYS is designed to get the kids moving and using tools to channel energy, release stress and make healthy choices! We currently offer sessions for 5-7 year-olds and 8-10 year-olds, each session lasts 45 minutes and we offer two different days of the week for the older age group. Our 2019 Spring Session registration is closed. Please see below for information on our Summer & Fall Sessions! Spring Session Cost is $85 for the 6-class program. Class size is limited to 12 students for ages 5-7 and 15 students for ages 8-12, so early registration is recommended! COMING SOON! See our Summer Session and Fall Session dates below. Registration for both will open May 1st! We will hold 4 Kids Yoga Playshops this summer, two for 5-8 year-olds and two for 9-12 year-olds. Playshops will last two hours and include yoga, games, crafts and a snack time. Wednesdays, 7/10 & 7/17, 1-3pm: 9-12 year-olds. Please contact us with any questions about the summer program! If you have any questions about our Kids Yoga program or schedule or you prefer to do this in studio or over the phone we are happy to accommodate you, please contact us at 845-977-5276. Liane first fell in love with yoga about 6 years ago. The practice changed her life and mindset and she continues on her spiritual journey to finding her true self. 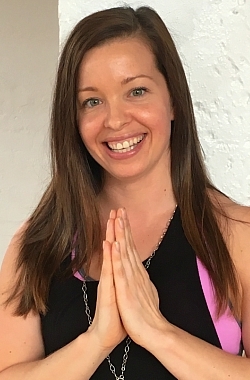 Liane knew that receiving her 95-hour children's yoga certification at Yoga Synthesis in Chestnut Ridge, NY would be the perfect balance of her love for teaching children and her love for yoga. A school teacher of 10 years, she shares her practice with the children in the classroom and through a morning yoga program. She's excited to continue to share her love of yoga to help children cope with stress and daily pressures and find peace and love within. Oh, and to have fun while doing it!